Unless you add to your college furniture, there will be only two seats in your dorm room. Your school-provided semi-comfortable dorm desk chair and your dorm bed. Of those two areas, they'll probably be both slightly off center from the middle of your room, which is where that overhead light will hang. In the corner of your dorm room, things can get a bit dark and dim. The solution? Simple. 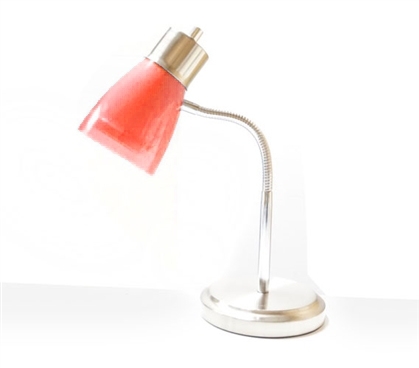 Include a dorm room desk lamp like this Gooseneck College Desk Lamp - Red as part of your dorm room supplies. This handy, cheap lamp for college will bring light to any dim corner of your dorm. Conversely, if it's too bright in your dorm room, provide your room with some lighting alternatives. To do that, add a dorm light or two. Flip off that overhead light and flip on this college desk lamp. Some dimmer lighting is perfect when you're watching a movie, or if you're still studying while your roommate's sleeping, this college item is just the dorm supply you'll need. This light plugs in for power, meaning you won't have to rely on power-draining and money-wasting batteries. And while it's a basic dorm item, this college lamp can go a long way in making dorm room living that much more convenient and bright.